Greetings to Our Partners from All Communities! The newly formed Minnesota Council for HIV/AIDS Care and Prevention (MCHACP) began work in February 2016. With the evolution of rapid testing and quicker connection to care, the benefits of medications leading to undetectable viral loads and Pre-Exposure Prophylaxis (PrEP) for those at risk, and more and more people with HIV living normal life spans, the old gaps and differences between HIV prevention and care are blurring and coming together. For these reasons and to better align with the updated National HIV/AIDS Strategy Minnesota created a single community planning body by integrating the work of the previous prevention and care planning groups (Minnesota HIV Services Planning Council and the Community Cooperative Council on HIV/AIDS Prevention) to combine prevention and care efforts. Though this integration signals a new era in collaborative efforts, the work and achievements of the previous two councils cannot be overlooked. MCHACP is a collaborative effort between the Minnesota Department of Human Services (Ryan White Part B Grantee), Hennepin County Public Health (Ryan White Part A Grantee), and the Minnesota Department of Health (CDC HIV Prevention Grantee). The council’s membership includes a broad representation from the affected communities and those who have a stake in HIV prevention and care. Representation includes persons working in the areas of prevention, corrections, education, social services, mental health, faith, health care, Tribal health, and local public health. 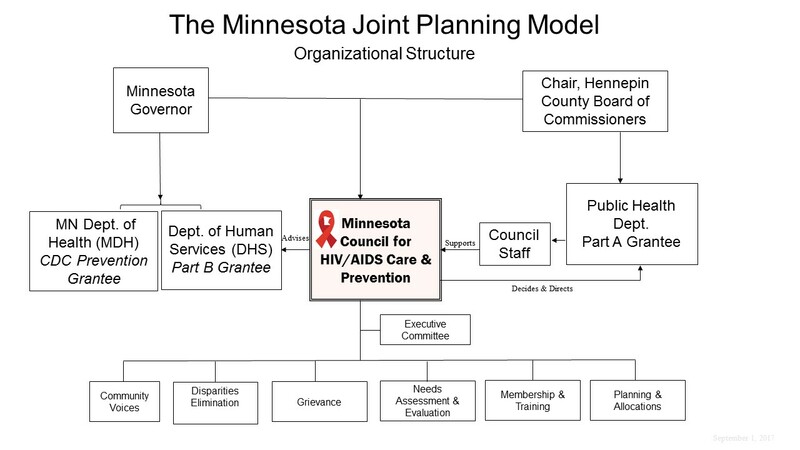 It is the responsibility of MCHACP to: oversee the development, update, and monitoring of the Minnesota comprehensive jurisdictional plan for HIV prevention, care and treatment; allocate federal Ryan White funds for Part A for HIV treatment and care services; make allocations recommendations to Part B for HIV treatment and care services; and prioritize populations for HIV prevention services. Want to know how to get involved or need more information? Please visit our Prospective Members tab. All MCHACP meetings are open to the public and we always welcome membership applications. During the year there will be new ways for people to give their input and have their voice heard. Given the continuing impact of HIV/AIDS on so many lives, there is much to be done. We look forward to working together on these important priorities. If you have questions concerning the MCHACP, please do not hesitate to contact our staff.